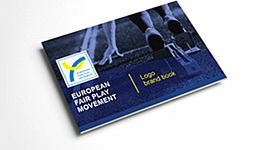 After 5 years of annual meetings with ideas exchanged about the campaigns promoted in their countries and hawing recognised the importance of having a European Body on working Fair Play, representatives from 14 countries decided to create the European Fair Play Movement (EFPM) in a Founding Assembly held at FIFA House, in Switzerland, on May 27/28, 1994. The EFPM is run by the Executive Committee composed of nine members chosen by the General Asembly from amongst its members and appointed for a term of four years from te Games of the Olympiad. Te General Asembly is held once a year. The members of the Executive Committee work in an honorary capacity. 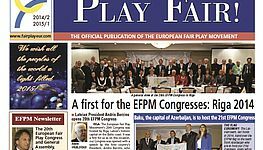 The main aim of the European Fair Play Movement is to promote Fair Play and Tolerance in the broadest sense (in sports and everyday life) at European level. 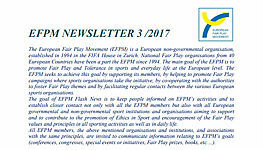 The EFPM seeks to achieve this goal by supporting its members, by helping to promate Fair Playcampaigns where sports organisations take the initiative, by cooperating with the authorities to foster Fair Play themes and by faciliating regular contacts between the warious European sports organisations.